This high-quality spherical bearing upgrade kit allows you to upgrade the inner bushings on your existing B5-B6-B7-C5 Audi A4-S4-RS4 and A6-S6-RS6 Density Line Adjustable Upper Control Arms with motorsport-grade Aurora spherical bearings. 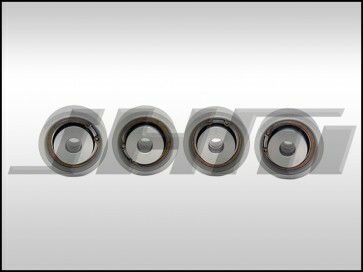 This kit is designed to be pressed into 034MS Density Line Adjustable Upper Control Arm Kit , and features anodized billet aluminum bearing adapters and spacers, Aurora AU-PWB-12T spherical bearings, and internal circlips. Every kit comes as a set of four fully assembled adapters for installation into one complete set of upper adjustable control arms. Please Note: This kit is not designed for use with factory control arms, and is only compatible with 034MS Density Line Adjustable Upper Control Arm Kits.